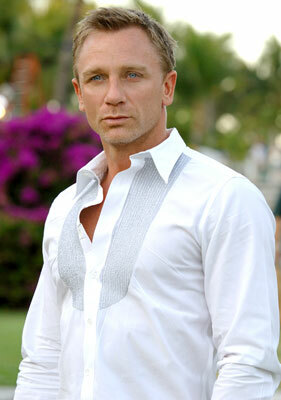 A PICTURE OF DANIEL CRAIG TO BUTTER YOU UP BECAUSE I KNOW YOU LOVE HIM. No, I haven't abandoned you, despite how it may feel every time I click over here and then click quickly away without typing a single word. I've been working on other projects. Projects that could potentially put my silly internet typing out to more people than just the 28 wonderful people who admit to following this page, and my mom. Because, for me, the important thing is to have my work read by other people, and not just me when I go back and read something and giggle over it when I'm alone and drunk on my couch at night. But there is good news. There will be Frightening Friday posts in October, unless I die before then. So, keep your widgets peeled, Blog, because it will happen. Of course you should keep in mind that I am the queen of empty blog promises, so there is a 45% chance that it won't happen. But, still, I will be attempting to make the effort. And if I don't, know that I will have a cinder block of guilt sitting on my chest making things very uncomfortable throughout November. Anyway, farewell for now, Blog. Yay, Frightening Friday! My favorite! Also, if your blog gives you any lip, tell it to talk to mine--it's been neglected since November 2009! Don't worry. Pictures of Daniel Craig makes everything better. But if you don't do Frightening Friday in October, you're gonna have to pull out the big guns and use a Casino Royale pic of him coming out of the water in that blue bathing suit. @AmRed: Yes, I realize that. It's ON now.